The Norse pseudo-god Loki, who is by turns the friend and the enemy of the other gods, had three fearfully hideous and strong children with the giantess Angrboda (“She Who Bodes Anguish”). The first was the serpent Jormungand, and the second was the death-goddess Hel. The third was the wolf Fenrir. The gods had terrible forebodings concerning the fate of these three beings. And they were absolutely correct. Jormungand would later kill the god Thor during Ragnarok, the downfall of the cosmos, an event which would be largely brought about by Hel’s refusal to release the radiant god Baldur from the underworld. 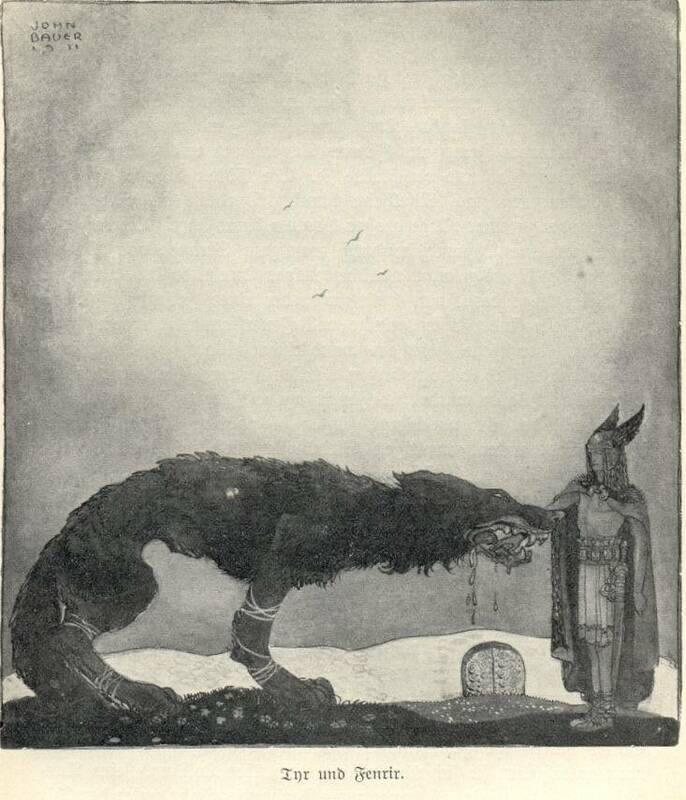 During these cataclysmic events, Fenrir would devour Odin, the chief of the gods. In order to keep these monsters at bay, they threw Jomungand into the ocean, where he encircled Midgard, the world of humankind. Hel they relegated to the underworld. Fenrir, however, inspired too much fear in them for them to let him out from under their watchful eyes, so they reared the pup themselves in their stronghold, Asgard. Only Tyr, the indefatigable upholder of law and honor, dared to approach Fenrir to feed him. Fenrir grew at an alarming rate, however, and soon the gods decided that his stay in Asgard had to be temporary. Knowing well how much devastation he would cause if he were allowed to roam free, the gods attempted to bind him with various chains. They were able to gain the wolf’s consent by telling him that these fetters were tests of his strength, and clapping and cheering when, with each new chain they presented him, he broke free. At last, the gods sent a messenger down to Svartalfheim, the realm of the dwarves. The dwarves, being the most skilled craftspeople in the cosmos, were able to forge a chain whose strength couldn’t be equaled; it was wrought from the sound of a cat’s footsteps, the beard of a woman, the roots of mountains, the breath of a fish, and the spittle of a bird – in other words, things which don’t exist, and against which it’s therefore futile to struggle. Gleipnir (“Open”) was its name. When the gods presented Fenrir with the curiously light and supple Gleipnir, the wolf suspected trickery and refused to be bound with it unless one of the gods would lay his or her hand in his jaws as a pledge of good faith. None of the gods agreed, knowing that this would mean the loss of a hand and the breaking of an oath. At last, the brave Tyr, for the good of all life, volunteered to fulfill the wolf’s demand. And, sure enough, when Fenrir discovered that he was unable to escape from Gleipnir, he chomped off and swallowed Tyr’s hand. Of all of the surviving Norse myths, this tale is the only one that prominently features Tyr. Without it, we wouldn’t understand Tyr’s character or role nearly as well as we can with the help of this myth. Many people who have only a passing knowledge of Norse mythology think of Tyr as a war god. That he certainly was, but virtually all of the Norse gods and goddesses had something or another to do with war. Tyr, like all of the other Norse war gods, was far more than only a war god. This myth powerfully illustrates Tyr’s role as the divine legal expert and upholder of the law. In the words of the celebrated scholar of comparative religion Georges Dumézil, when Tyr sacrifices his hand, “he not only procures the salvation of the gods but also regularizes it: he renders legal that which, without him, would have been pure fraud.” The gods had sworn an oath to Fenrir, and the guarantee of their intention to follow through with their pledge was Tyr’s hand (or arm – the percentage of the limb bitten off by Fenrir is irrelevant). When the gods didn’t follow through with their oath, Fenrir was entitled to Tyr’s hand as compensation. By allowing the wolf to claim his limb, Tyr fulfilled the gods’ end of the bargain, grisly and tragic though it was for him. Dumézil, Georges. 1988. Mitra-Varuna: An Essay on Two Indo-European Representations of Sovereignty. Translated by Derek Coltman. p. 142.